First - a few basics. The Scotland Office is a UK Government department in its own right. We may not be as big as some but our predecessor, the ‘Scottish Office’, was set up in 1885, and the modern incarnation has existed since the advent of Scotland’s devolution settlement in July 1999. Whilst most of the policy delivery functions of the old office moved in 1999 to the Scottish Government, we still play a key role – at the heart of the UK Government, as part of the newly formed UK Governance Goup – in ensuring the settlement functions properly. We are of course one of three Territorial departments – alongside the Wales and Northern Ireland Offices – who fulfil similar functions. If you follow the news - even just a little bit - it probably hasn’t escaped your notice that Scotland had an independence referendum in 2014, followed by the Smith Commission on further powers, and then the introduction of the Scotland Bill into the UK Parliament in May. Lead by the Scotland Office, the Bill includes extensive new powers – particularly on taxation and welfare – that will build on the wide range of powers devolved in 1999, making the Scottish Parliament one of the world’s most powerful, devolved parliaments. But what else do we do and how does this support the broader objectives of UK Departments and the UK Government? A significant proportion of our time is spent providing input within Government on the development of policy and legislative proposals in areas that remain the responsibility of the UK Parliament – for example working in partnership with DWP on the development and passage of their Welfare Reform and Work Bill or BIS’ Trade Union Bill. While not a substitute for the lead policy department, we often have the most direct relationship with stakeholders in Scotland and regularly convene engagement opportunities on specific departmental policy issues as well as the bigger constitutional policy questions. Our Offices in London (Dover House) and Edinburgh (Melville Crescent) are a resource that can be used by UK Departments for these purposes. Where appropriate, they are also used by third parties, for example to showcase Scotland’s creative, business and food and drink industries. We also undertake a broader programme of public facing engagement which means doing things and going to places that might feel slightly unusual to policy and operational staff in most UK departments. And it does lead to interesting ventures - most recently to the Borders Union Show in Kelso in July. Alongside local Jobcentre Plus staff and colleagues from the Department for Culture Media and Sport, we set up shop alongside 200 trade stands including farm machinery, crafts and gifts, clothing, equestrian goods, food outlets and furniture retailers as well as a Children's Fun Fair. We did this to engage with businesses and local communities to hear their ideas and concerns and share information about what is happening with the Scotland Bill as it makes its journey through the UK Parliament and what the new powers would mean for Scotland. We had with us a wide variety of information from across UK Departments and Agencies that explained policies and initiatives and how to access the vital domestic and international services that the UK Government provides. 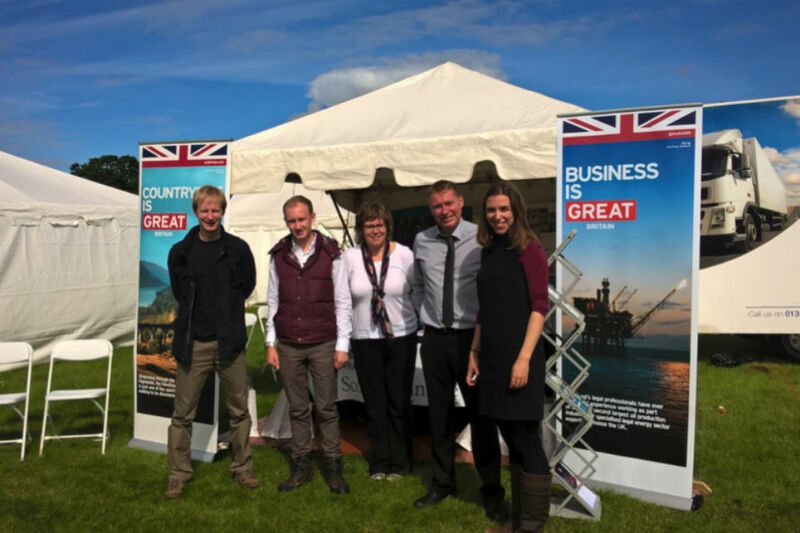 UK Government staff attending the show met local people and discussed face to face a huge range of subjects from foreign affairs and international development to energy regulation, welfare, pensions, high speed rail and the rollout of broadband. For the Jobcentre Plus team it was also an opportunity to make connections with local businesses who are so important in helping people back into the workplace. As the devolution settlement changes and evolves so does our work. We will continue to act as guardians of the devolution settlement and we will always speak up for Scotland within Government. As part of the Devolution and You campaign civil servants across the UK Government will have an increasing understanding of the developing settlement, and how their work fits with it, as well as how to ensure that their work helps the UK Government deliver effectively for the people of Scotland as part of our United Kingdom.